Volunteers contribute in many ways to the building and curation of the collections of the State Herbarium of South Australia, as well as to our various research programs. Their invaluable contribution enables the State Herbarium to continue to house a world class collection of more than one million specimens. What does the State Herbarium do? 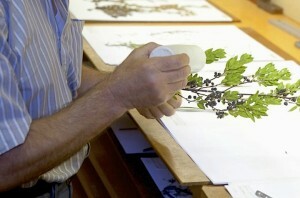 The State Herbarium of South Australia houses a growing collection of plant specimens that represent the diversity of species found in the State. This collection is stored in a preserved condition that is expected to maintain these specimens for centuries. The specimens provide the basis for describing and recognising every different type of plant, algae, fungi and lichen known to occur in the wild in South Australia. Collections aim to include all known native species and introduced weeds. Plant specimens are collected by Herbarium staff, or lodged at the Herbarium by other researchers, amateur botanists and members of the public. The collection now consists of over one million specimens and is currently growing by around 10,000 new specimens a year. Looking after these specimens so they remain in good condition, preparing and incorporating new specimens, and making the collection available to researchers is a very labour intensive job requiring much care and meticulous attention to detail. What can volunteers do at the Herbarium? Volunteers provide vital support to the State Herbarium by helping with many of these labour and time intensive tasks that paid staff cannot readily find time to do. Any help in these areas is very much appreciated. You can choose to work on a single task or vary your tasks. You can also work as part of a team or by yourself – whatever suits you. The complexity of tasks can vary depending on your interests and skills. You may be able to work on projects that give you new skills if you want including a better understanding of how plant species are first recognised and subsequently identified. Typically volunteers assist with the processes that turn a collected dried plant into a fully documented and mounted herbarium specimen. These specimens are meant to be preserved for perpetuity so your contributions to this process could be appreciated for hundreds of years! Other useful volunteer tasks can involve filing specimens in the vast Herbarium vaults where specimens dating back to the first European explorers lie alongside specimens you may have mounted and labelled. Volunteers with computer skills help with scanning and data entry. Volunteers can come from a variety of backgrounds and interests. Students often volunteer at the Herbarium both to gain a better understanding of the science of botanical taxonomy and to make contact with individuals and organisations that could lead to their eventual employment or more specialised studies. Other volunteers include retirees some of whom have been actively working at the Herbarium into their 90s, some are retired professionals who want to contribute their former work skills to advancing knowledge on species identity and conservation.